People have been begging for updates on the progress being made in our relief and rebuilding efforts in Lakeshore. 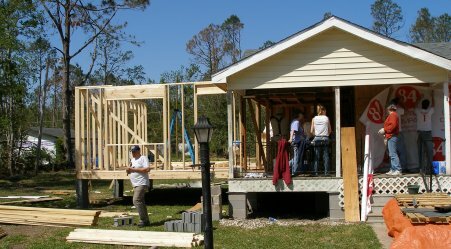 Here are some of the things we did this past week April 3-8 with the help from volunteer teams from Georgia, Kentucky, Michigan, New Jersey, and South Carolina. Framed up Richard’s house on Lakeshore Road. Put a roof on Angela and Dave’s new house. Set the floor beams for Vic and Tammy’s house. Worked in Rich and Angie’s house. Hung sheet rock in Bulla Peterson’s house. Hung and finished sheet rock in the Island’s house. Replaced the windows at the Morran’s and sanded sheet rock. Ripped off and re roofed the Skinner house. Replaced the addition on Violet Patterson’s house. Rewired Bubby and Vicki’s house. Finished putting up the siding on Butch and Sandy’s house. Set a tub in somebody’s house. Did lot’s of work at Freddy’s house. Trimmed the windows in “Aunt Gloria’s house. Hosted a film crew from NAMB. Painted, installed siding, and hung a door for the church vestibule. I have a flash drive full of pictures from the last 7 days, but I will have to hold off on posting them now. I have a funeral to do this morning and we host an Easter Cantata this afternoon. Five new teams, with nearly 100 volunteers arrive today. Baptist Press did a great story on us this week. LAKESHORE, Miss. 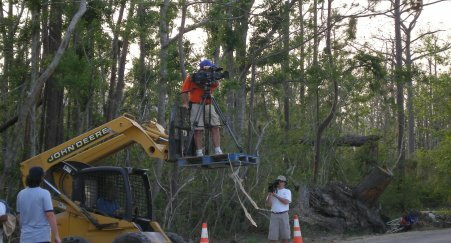 (BP)–When Hurricane Katrina struck last August, Lakeshore Baptist Church in Mississippi relocated, but not because members voted. 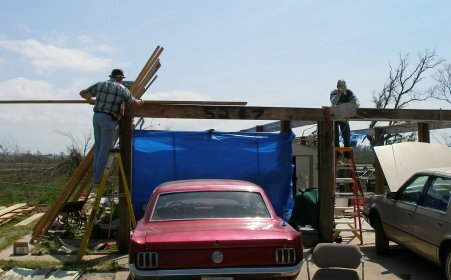 Katrina’s winds and waves smashed the wood-frame structure. What wasn’t blown away floated away from the site about a mile from Mississippi’s Gulf Coast. Members recovered the pulpit, a few lumber scraps and the steeple. Working on his doctoral degree at New Orleans Baptist Theological Seminary, Lakeshore’s pastor, Don Elbourne, relinquished his studies to coordinate disaster relief efforts in the predominantly Catholic neighborhood. 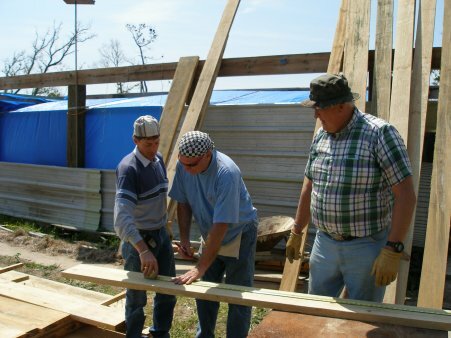 The Southern Baptist Convention, the North American Mission Board, the Mississippi Baptist Convention, the Gulf Coast Baptist Association and countless Southern Baptist volunteers from 38 states have rallied with Elbourne and Lakeshore’s members to turn the devastated area in Katrina’s path into a crossroads of crisis and Christ-likeness. As Norm Miller highlighted, the relief, recovery, and rebuilding efforts still continue. The job is far from over. We see a long road ahead and we appreciate Baptist Press keeping the ongoing need in the public eye.